Qatar has the best deals to Australia right now between Stockholm and Canberra, which is just a short 1.5 to 2 hour hop from Sydney or Melbourne. 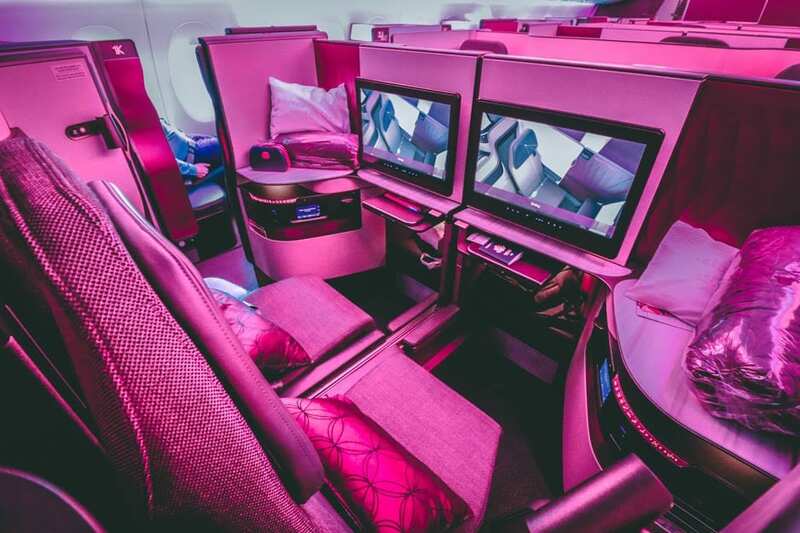 The good news: all Qatar flights from Doha to Canberra (and back) feature the legendary QSuites. For about £100-£200 more depending on dates, you find Gothenburg to Sydney or Copenhagen to Melbourne. You can peep a review here. Even if Sweden isn’t where you call home, these deals can be worth traveling to Stockholm for, since the savings may still be greater. That’s especially true if you use points or miles to get from your home base to Sweden. From Stockholm to Doha QSuites will only be on select flights, and you can use the ExpertFlyer Seat Maps to see if yours will. QSuites look like this. If the map for your flight doesn’t look like it, as of that moment you won’t have them for that segment. No worries, they’ll probably look like this instead. All flights feature dine on demand and the other stuff that makes life fairly grand. There’s even a good French Bordeaux. There’s no telling how long these deals will last and availability tends to go fairly fast. You’ll find the best availability in February, March, April and August. Outbound: most of February, most of March and August 19th. Return: Feb 18, 19, 20, 26th. March O6, 07, 10, 14. and 05 September. Qatar makes booking fairly easy, thanks to a seven day calendar for both departure and return. Look for dates on QatarAirways.com where prices are roughly 10,000 SEK each way, which brings you to a total price around £1800. On some dates, it may even be slightly less. You can book here. Also, select “premium only” to filter out economy. Happy hunting. Why won’t they let us fly this in reverse! $6500 AUD in reverse.Us Aussies just get screwed on flight costs. Frustration = warranted. Australian airlines are vicious with pricing but hopefully competition will force them to sober up. In the interim, my advice would be to consider using miles or a cheap deal to get from Oz to Europe if you plan to make multiple return trips. For example, use miles to get to Europe, enjoy Europe. Use this deal to get back to Oz. Then if you will be returning, use it a month or two later to go back to Europe. Obviously it only works if you have repeat needs, but it can be a great way to save. Overrated product. Came back on 4 x Qsuites last week. Very nice deal indeed, but i need SE Asia rather than AUS deals at the moment. Fingers crossed for a big global QR sale being launched soon!